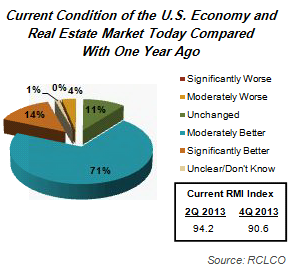 The results of RCLCO’s latest Market Sentiment Survey are in, and while 67% of respondents continue to report that U.S. economic and real estate conditions were moderately or significant better than one year ago, a growing share of respondents see conditions as stagnant or beginning to decline. 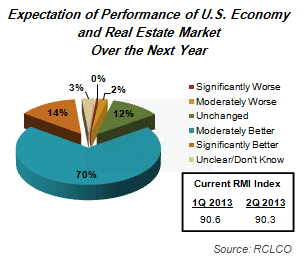 In a departure from the past three years of consistently positive sentiment, RCLCO’s National Current Real Estate Market Index (RMI1) dropped nearly 10 points from six months ago, to 79, and respondents predict RMI will drop another 14 points by this time next year. 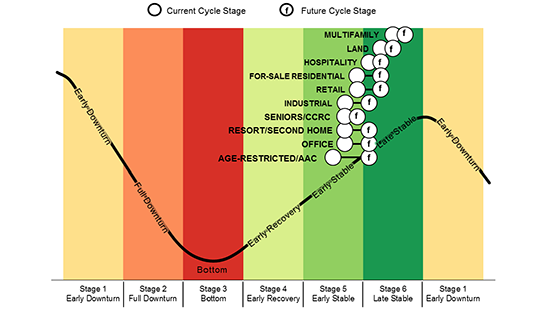 How much run is left in the expansionary phase of this market cycle is clearly a question on everyone’s mind. 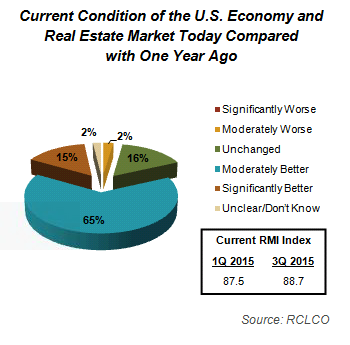 The bright spot is sentiment about the market’s performance over the last year: a majority (57%) of respondents continue to report that U.S. economic and real estate conditions were “moderately better” today than one year ago. Combined with those who report “significantly better” conditions, positive sentiment about the last 12 months clearly outweighs the negative. However, the share reporting moderately or significantly better conditions continues to erode, from 78% 12 months ago to 67% today. 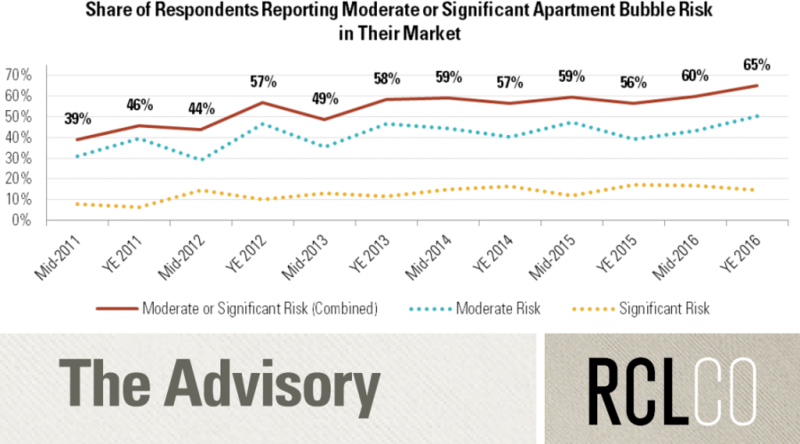 Respondents are now more likely to report stagnant or moderately worse conditions. Overall, sentiment about the past 12 months is the least positive it has been since our 3Q 2012 survey. 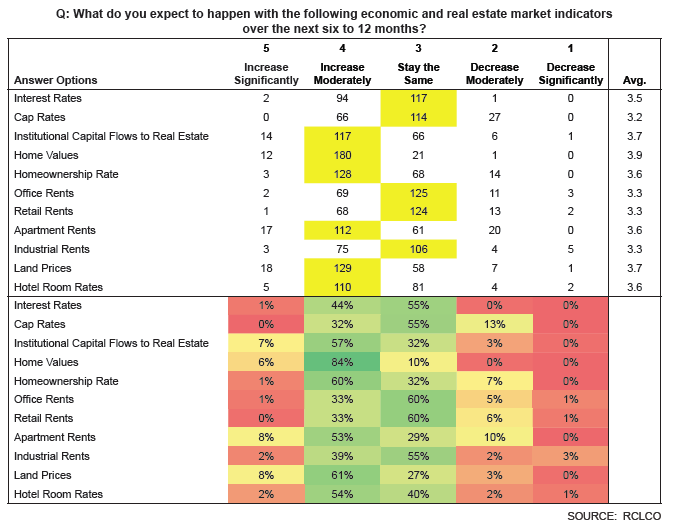 Looking forward, respondents are also much more likely to anticipate that the national economic and real estate climate is unlikely to change or even worsen over the next 12 months. 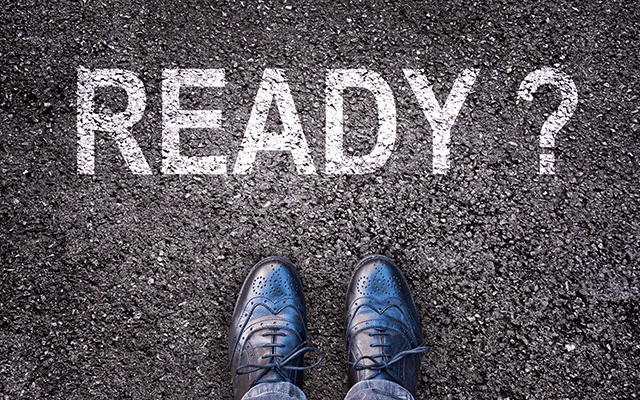 While 47% do expect moderately or significantly better conditions 12 months from now, the drop-off in positive expectations is severe—down 22 percentage points from two quarters ago. Perhaps even more significantly, this is the first survey since 3Q 2011 in which the majority do not expect conditions to improve. 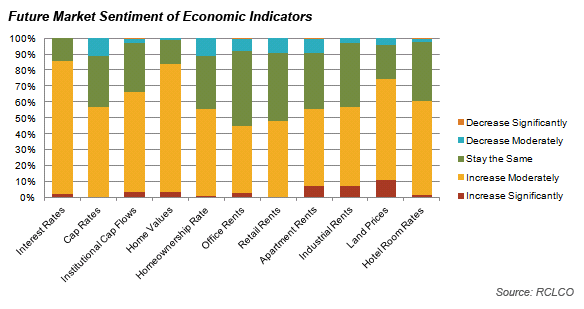 In line with assessments of national performance, a small but growing share of respondents are reporting less positive economic and real estate market performance at the local and regional level. 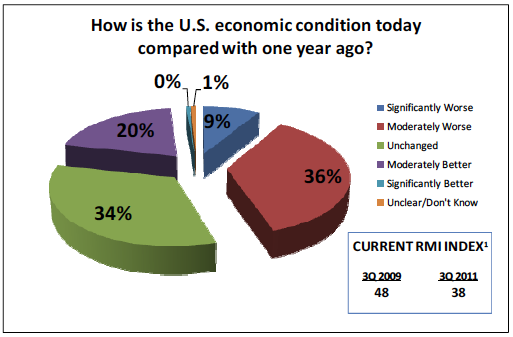 While over two-thirds of respondents report moderately or significantly better conditions today compared with 12 months ago, there is an uptick in the proportion of respondents indicating that regional conditions have in fact moderately worsened, from 7% in 3Q 2015 to 11% today. 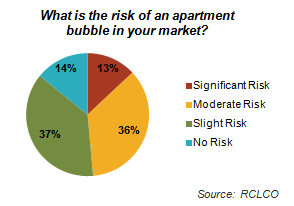 Further, 14% anticipate moderately worse regional/local performance over the next year. 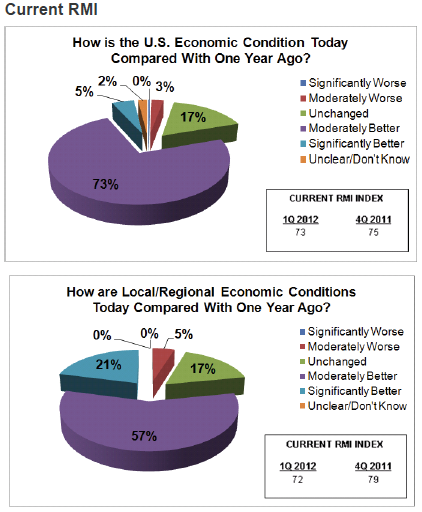 As with the national outlook, a significant share of respondents anticipate regional/local conditions to remain unchanged. A sizeable share (17%) continue to report that regional conditions today are significantly better than one year ago, as compared with only 10% who are this positive about national conditions. However, the share who report significantly better regional conditions is trending down, from 20% one year ago and 29% 18 months ago. 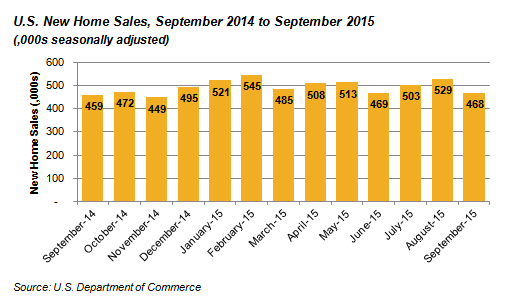 Overall, therefore, aggregate local and regional conditions for the past year mirror the trends seen nationally. 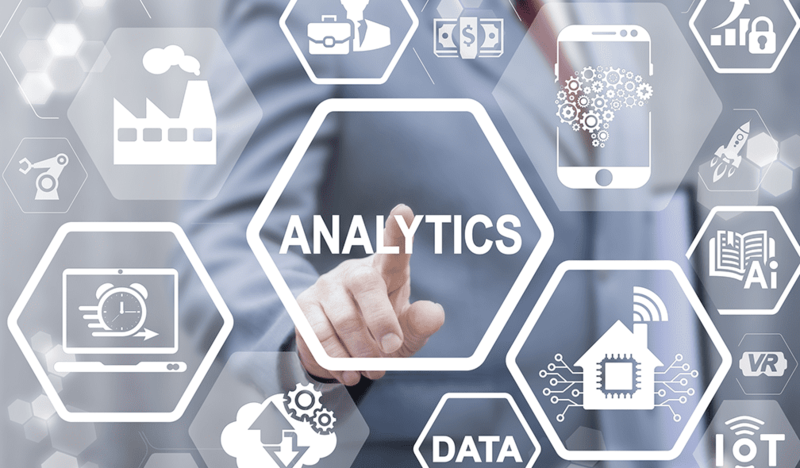 In light of struggling oil and gas industries, sentiment in Texas and the South Central region of the country has altered significantly in the past six months and is now substantially more pessimistic than the nation overall. 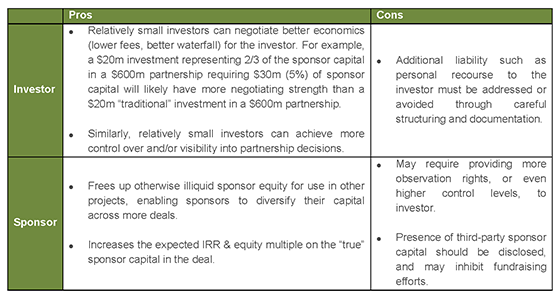 RMI dropped from a fairly positive 74 to 52, a drop of 22 points. 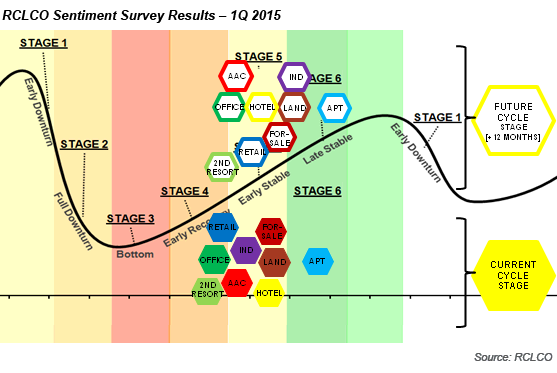 In our 3Q 2015 survey, 75% of respondents who were most active in these regions reported moderate or significant improvement in conditions over the prior 12 months. 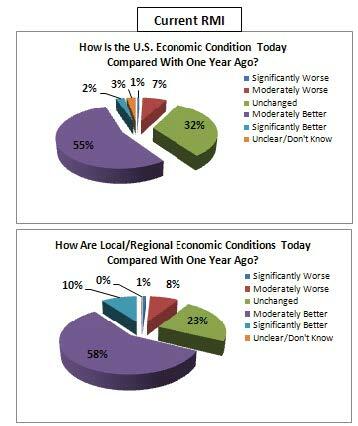 Only 17% believed regional conditions were worse. 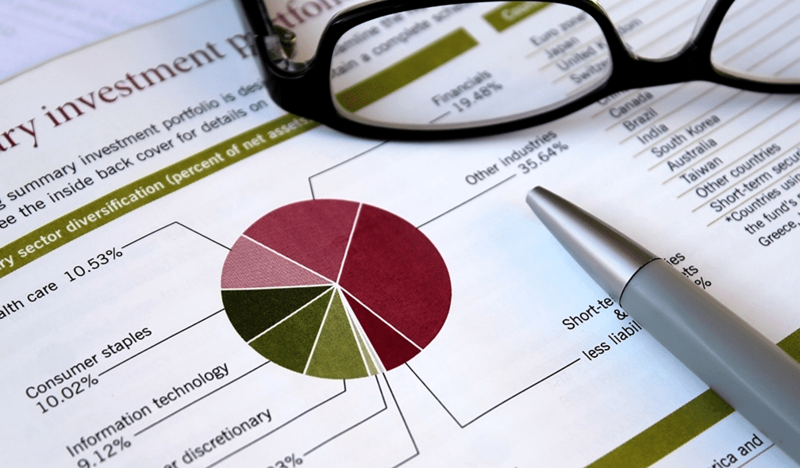 Today, however, 39% believe the market has worsened during the latest 12-month period, and the share reporting improved conditions shrunk to 43%. Only 29% believe conditions will get better in the year ahead; the rest are fairly evenly split as to whether conditions remain the same or decline further. 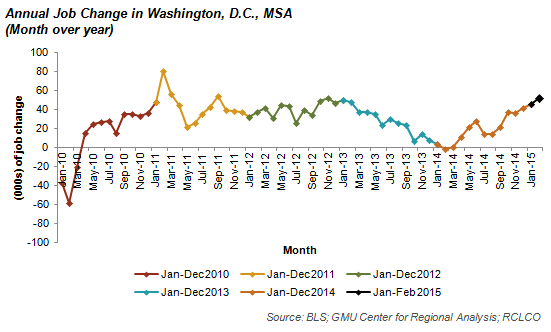 Steady Sentiment in Washington, D.C. Sentiment in the national capital region, on the other hand, aligns more closely with respondents’ assessments of the nation as a whole. 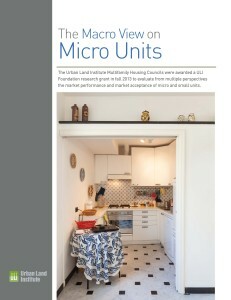 Over one-half of respondents who work in this area continue to observe moderately better regional performance, but 17% do report that conditions have worsened over the last year. 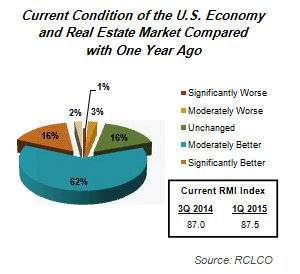 On the whole, current RMI remains stable, moving from 74 in 3Q 2015 to 72 today. Expectations for the next 12 months are more positive for the region than for the nation, with a majority predicting ongoing improvement in the market, similar to the levels reported in the previous two sentiment surveys. 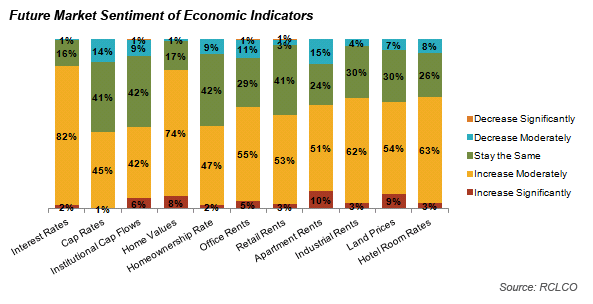 Almost three-quarters of respondents who are most active in the Southeast have seen a moderate or significant improvement in local/regional conditions from 12 months ago. However, as is the case nationally, the share reporting better conditions has eroded—down from 89% in the 1Q 2015 survey. 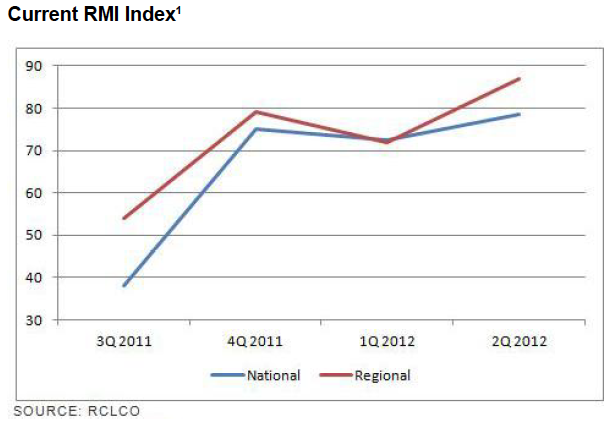 The drop in current RMI from a rosy 96 six months ago to a lower but still positive 79 today reflects this trend. 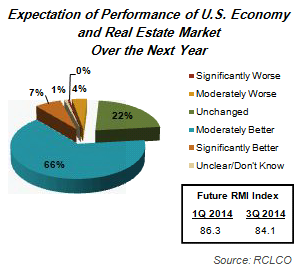 In Florida specifically, RMI remains more positive (88), but the same trend applies. 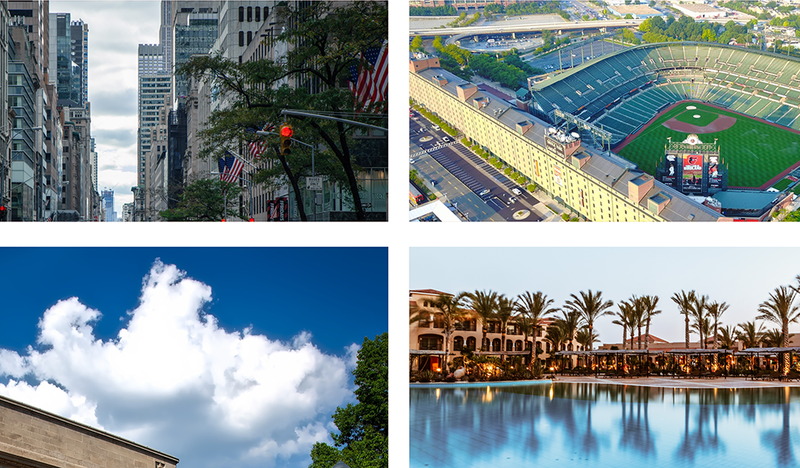 As a result, fewer respondents across the Southeast expect that conditions will continue to improve as much over the next 12 months as they have in the previous 12 months; instead, a growing share anticipate market conditions to remain unchanged. 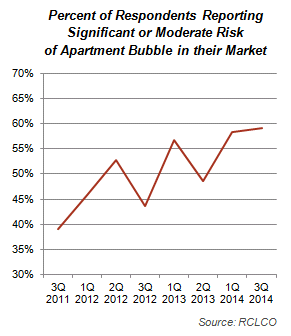 Overall, though, the perceived threat of worsening conditions in 2016 remains low. While 16% anticipate moderate declines across the U.S., only 7% foresee such conditions for the Southeast. Current sentiment suggests that respondents believe we are further through the current cycle than previously anticipated and that there is less remaining upside than expected six months ago. 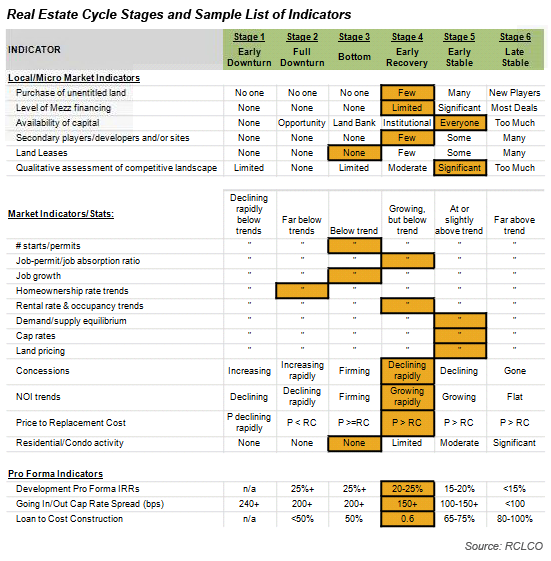 What conditions respondents may have interpreted as markers of the “early stable” phase of the cycle in 3Q 2015 look more like indicators of the “late stable” phase today. 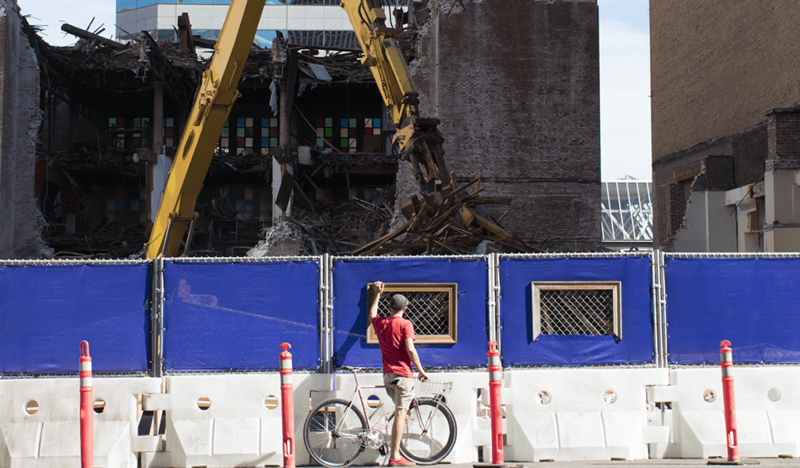 What does this mean for the timing and severity of the next downturn? Stay tuned for Part 2 of our results to find out. 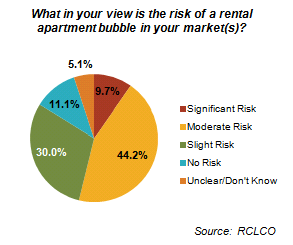 Part 2 of RCLCO’s latest National Market Sentiment Survey Results will be released next week. 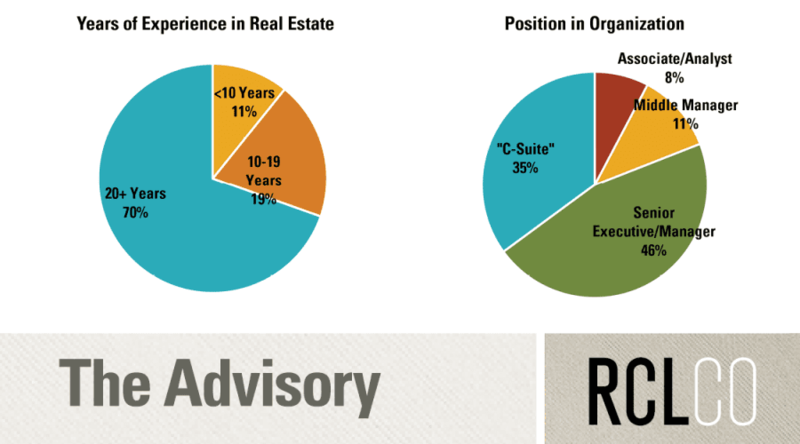 In it, we will discuss expectations surrounding the next downturn and take a closer look at sentiment by real estate product type.